Cheddar Cheese is a staple in many diets. Freeze Dried Cheddar Cheese is a great way to add this staple to your long term food storage plan. As an excellent source of Calcium, Freeze Dried Cheddar Cheese is very good for building and maintaining strong, bones, teeth, and cartilage. 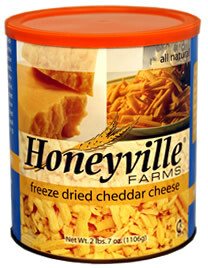 Freeze Dried Cheese can be eaten straight out of the can as a snack or can be rehydrated and used in any recipe calling for shredded cheddar cheese. Once rehydrated, Freeze Dried Cheddar Cheese can be melted and cooked just like fresh cheddar. Each large #10 can contains 2.4375 pounds of Freeze Dried Sharp Cheddar Cheese. Ingredients: Pasteurized Milk, Cheese Cultures, Salt, Enzymes, and Annatto (Vegetable Color). Shelf Life: Freeze Dried Cheddar Cheese can be stored for 5 to 10 years in the sealed #10 can (with enclosed Oxygen Absorbers) under ideal storage conditions (a cool, dry place).